Review by Benjamin Beit-Hallahmi, Ph.D.
Michael Ruse defines "Darwinian theory" as "evolution through natural selection" (pp. 87-88). This theory, presented to the world by Charles Darwin, has become the most potent symbol of science, as the ruling paradigm in biology. The assumptions of the evolution paradigm are a threat to religious ideas, and not only because of the account of human descent from other species. It assumes no design, no intentionality, and no guiding hand, but rather randomness and purposelessness, with events only subject to the impersonal, natural, laws of physics and chemistry. We know that Darwin and evolutionary theory have become symbols of modernity and secularity, and have been criticized not only by politicians in the United States such as Ronald Reagan, Jimmy Carter, and George W. Bush, but also by conservative leaders in other countries. This book is a etailed survey of elite modern culture, and tries to demonstrate how Charles Darwin's theories have played a role in secularizing literary creations and upper class discourse in the Anglophone world. Ruse's survey of modern literature is impressive. It includes, among others, writings by Benjamin Disraeli, Tennyson, Samuel Butler, George Eliot, Thomas Henry Huxley, Robert Louis Stevenson, Emily Dickinson, H. Rider Haggard, Rudyard Kipling, Joseph Conrad, Thomas Hardy, Edith Wharton, Upton Sinclair, Kurt Vonnegut, and Ian McEwan. Ruse's strategy for looking at literature follows an 1873 quotation by Henry James: "Middlemarch is too often an echo of Messrs. Darwin and Huxley" (p. 72). In each literary creation, he demonstrates Darwin's influence by looking at the text and adding historical and biographical information. His analyses of literature are detailed and fascinating, but specialists may argue with his interpretations. The attention to Darwin's ideas is well-justified. As one historian suggested, they were unique in tricking down to the masses, or at least the educated masses, even if Marx was more influential (Chadwick, 1975). Ruse comments on various aspects of Darwinism and its impact. One issue is noteworthy. There has been an ongoing and furious debate about Charles Darwin's own responsibility for Social Darwinism. Ruse expresses his most recent stand in a footnote: "… what worries me is that there is a tendency to separate "Social Darwinism" (bad) from "Darwinism" (good), and to suggest that it is not really a Darwinian idea but owes more to others, particularly Spencer. As a hitherto-egregious sinner in this regard now repenting: the ideas are in Darwin—he endorsed capitalism fully…" (pp. 150-151, footnote 2). This revelation in a footnote was quite a surprise to me. 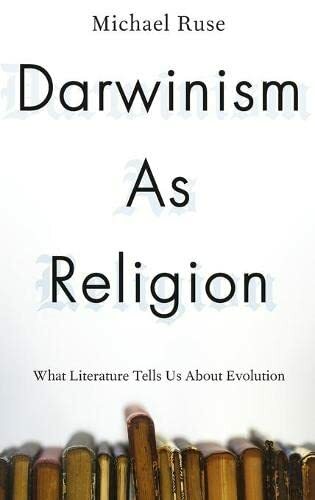 My main difficulty with the book has to do with the idea that evolutionary theory in its popular, non-academic, form has become a religion: "I argue that Darwinism can be considered a religion because like Christianity it speaks to such issues as deity, origins, human status, morality, suffering, and more" (p. 82). I find this claim unfounded. There are religions without gods, morality, or origins, and it's possible that Christianity is indeed marked by all of those. Would Ruse change the title to Darwinism as Christianity? It would sound even worse. Does Ruse think that Darwin is regarded as a deity? It's unclear. Polemically, many beliefs systems, such as Marxism or psychoanalysis, have been called religions. This was never meant as a compliment. Calling an academic theory or a political ideology a religion is likely to add confusion rather than clarity. "Religion has meant many things in human history: but when from now onward I use the word I mean to use it in the supernaturalist sense, as declaring that the so called order of nature, which constitutes this world's experience, is only one portion of the total universe, and that there stretches beyond this visible world an unseen world of which we now know nothing positive, but in its relation to which the true significance of our present mundane life consists" (James,  1956, p. 51). While religion is unique in terms of content, its consequences cannot always be distinguished from that of other ideologies. The question Is whether religion is a matter of style, or of substance. Religion is not a commitment style. It does not equal devotion, total commitment, or emotionality. Other belief systems, tied to commitment, emotion, ecstasy, and transformation, constitute secular ideologies. Some of the more dramatic aspects of religious behavior, including ecstasy or acts of extreme devotion culminating in total self-sacrifice, can be found in secular settings, motivated either by private love or by public nationalism. Somebody may be devoting his life to quantum chemistry, which he believes is the key to answering every question about the universe. He spends most of his days working on theoretical problems, to the neglect of other aspects of life. He may not be the only one, and he shares with his fellow quantum chemists an esoteric vocabulary and reaches real ecstasy when solving some equations. Is quantum chemistry a religion, or a "secular religion"? It clearly contains ontological claims but no references to the spirit world. If we look for strong commitment as the hallmark of religion, then we will have hundreds of thousands of religions on earth, much more than the tens of thousands that fit with the substantive definition that I outlined here. Fortunately, the academic study of religion, which involves thousands of scholars worldwide, seems to be unaware of attempts to add "secular religions" to the ideational systems which focus on the spirit world. A brief perusal of the programs in the annual meetings of the International Association for the History of Religions (IAHR), the Society for the Scientific Study of Religion, The International Association for the Psychology of Religion (IAPR), the American Academy of Religion (AAR), and similar organizations will show that religion scholars study, ahem, only religions. They discuss discourses about souls, ghosts, saints, or gods. They may mention Darwin or evolution, but only as secular phenomena, and they like it this way. Beit-Hallahmi, B. (2015). Psychological Perspectives on Religion and Religiosity. London & New York: Routledge. Chadwick, O. (1975). The Secularization of the European Mind in the Nineteenth Century. Cambridge: Cambridge University Press. James, W. (1897/1956). The Will to Believe. New York: Dover Publications. Benjamin Beit-Hallahmi has written about personality, identity, and religion. Among his recent books are Psychological Perspectives on Religion and Religiosity (2015), and Psychoanalysis and Theism (2010).